This year, we decided that we would spend Christmas in Singapore. More importantly, we decided that it is time to start our own family traditions. In years passed, we usually spend Christmas in France with my in laws. However, we feel that maybe it would make better sense for us to travel back to France when we do have longer breaks like in summer. 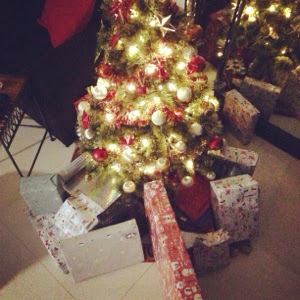 So this year, we planned for a Christmas at home! To be honest, I am really looking forward to it! As part of our Christmas, we decided to do a little family mission trip (I will post about this separately) which we did last weekend. For the actual Christmas event, for the French, Christmas Eve is really a family bonding time. So planning for Christmas Eve was exciting as it is the significant celebration. Following the years of what we had enjoyed, I planned a whole list food items which I thought would be great but the husband reminded me that it was too much for our little family. I finally scaled it down to these main items for our aperitif. 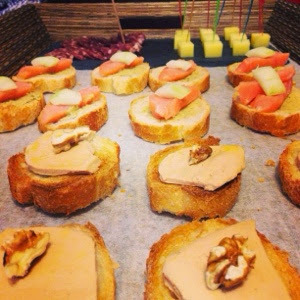 There were foie gras on toaste with walnut, smoked salmon on jalapeño hummus, saucisson and comte cheese. On the sides were some cheesy sticks and crackers. We served the kids sparkling juice and champagne for the adults. This is very much what we would eat in France too. Dinner was a simple roast chicken with potatoes and a side of buttered asparagus with baby corn. We finished the meal with a log cake and chocolate fondue for the little ones. After dinner, we commence a new tradition for the family whereby we all cozy up and watched a Christmas movie. For our inaugural family Christmas movie, we chose ELF after watching the trailers of a few options. It was a nice movie to finish off the night. And since it was such a feel good movie, the boy was all eager to prep for Santa's visit! So we worked to put aside some cookies (which I happened to baked just this afternoon) and milk. 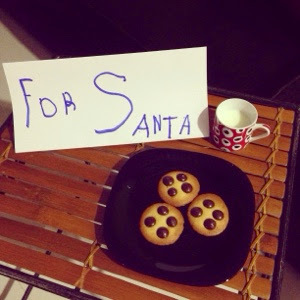 He wrote a note to let Santa know those were for him. 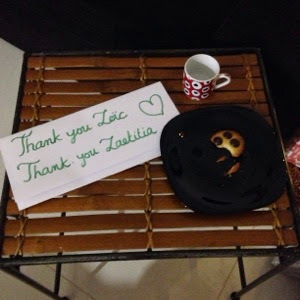 Finally we managed to put the kids to bed and realized that Santa came by, ate some cookies and left presents for the kids! So excited to see my two darling when they woke up on Christmas morning!